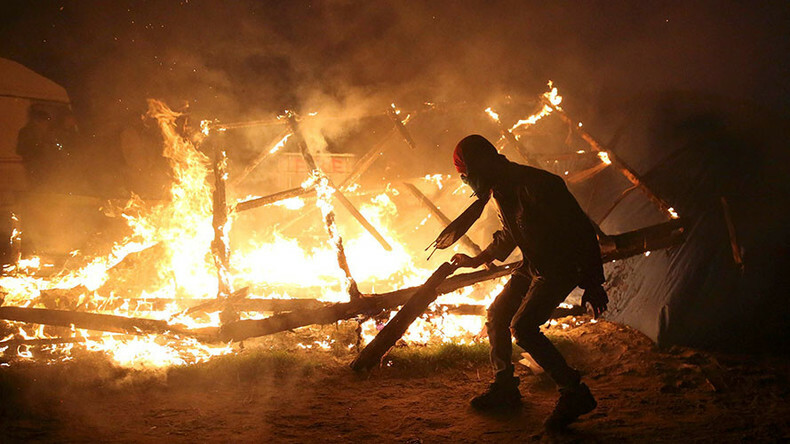 Chaos in the Calais camp resumed overnight, after demolition works restarted on Tuesday afternoon. Migrants opposing the demolition of the notorious camp reportedly set the remaining structures on fire. Several explosions – presumably of portable natural gas tanks – have been caught on video. Police secured the approaches to the camp for multiple fire crews to move in, according to RT reporter Harry Fear, who is at the site. The fire has been put out, but chaos at the camp persists. There is no information on possible casualties, as it is too dangerous to go into the ‘Jungle’ at night, as the migrants themselves warned Fear. French authorities began dismantling the ‘Jungle’ on Monday, and transporting the migrants en masse to 300 other sites across France. However, migrants refused to board the buses heading to other refugee centers in orderly fashion, trying instead to jump the highway fence. Police had to intervene to push them back. After fiery clashes between the police and migrants on Monday night, demolition resumed on Tuesday with workers dismantling the camp structures manually. The camp’s population prior to eviction was estimated around 8,000 people. Various ‘jungle’ migrant camps have existed around Calais since 1999. The infamous one currently undergoing demolition dates back to January 2015, when the French authorities had opened the Jules Ferry day center. It was designed to provide shelter for up to 50 women with children. As the migrant crisis escalated, about 1,000 migrants were living on the outskirts of Calais by April 2015. The migrants promptly built an open-air makeshift town, which housed over 10,000 people at the peak of the crisis. The area was plagued by multiple problems, such as surging crime, illegal trade, and unaccompanied minors. Denizens of the camp routinely clashed with the police who tried to keep them off the nearby highway, where the migrants were trying to board cars and trucks heading to the UK.